Enjoy two different four-course menus with your special someone. It doesn’t matter who gets which, because sharing is always a good idea, and not to mention way more romantic. After all, it’s Valentines. Start with crispy Salmon Fritters served with smashed avocado, lemon garlic aioli, and petite greens, and Sous Vide Octopus served with arugula, quinoa, dehydrated olives and sesame dressing. For soup, delight in a hearty, smooth Sweet Corn Velouté with grilled corn, chipotle foam, and popcorn, and Purple Yam Soup with Parmesan cheese meringue. 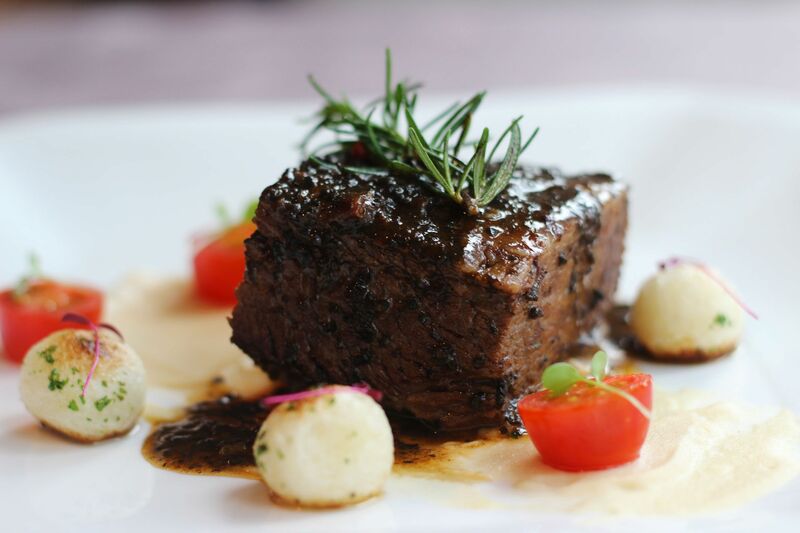 The highlights of this 4-course duo are the Oven-Braised USDA Short Ribs and Chilean Sea Bass—a perfect match of surf and turf. The USDA short ribs come with truffle, white bean puree, yellow cherry tomato, and turnips while the sea bass comes with fava beans puree, brunoise vegetables, and clam sauce. Cap your date off with some Vanilla Ice Cream Panna Cotta with red wine poached pear and apple crumble, and some Red Velvet Cheesecake with dehydrated coconut and vanilla tuile for dessert. Indulge in this sumptuous 4-course duo for a romantic, memorable date this Valentines. 22 Prime’s Valentine’s package is available at PHP 6,500 nett for two, inclusive of two glasses of wine, and a hand bouquet.